Your conference sponsorship investment provides significant value. Capitalizes on SEPA’s independence and respected brand. Allows you to tailor the focus on your communications and marketing objectives. Provides a great venue for the amplification of your message in a receptive environment. Provides many opportunities for one-on-one contact with community leaders and emergency planners. 10% of sponsorship and trade show fees are donated to support our scholarship fund. Recognition on the “front and centre / high traffic” display banner. Opportunity to post two “Industry News” articles per year. Click here if you wish to register online. ​Online payment is also available. You will be able to pick-up your Tradeshow package and Conference Pass, starting at noon on Nov 6, at the Galaxy B Lobby which is located on the west side of the Travelodge Hotel. The Galaxy B Lobby entrance is also the best area for you to off load your display material and equipment. You will be met there by a SEPA Conference Team member who will show you where your booth is located in the Galaxy B room. Open to delegates Nov 6 - 18:00 to 21:00. Open to delegates Nov 7 - 9:00 to 17:00. All breaks and the Tue evening reception will be held in the Tradeshow room. If you have promotional items they will be placed in the delegate bags on Wed Nov 7. You can ship these items prior to the event to the Travelodge Hotel Saskatoon, 106 Circle Dr. W, Saskatoon, Saskatchewan S7L 4L6. 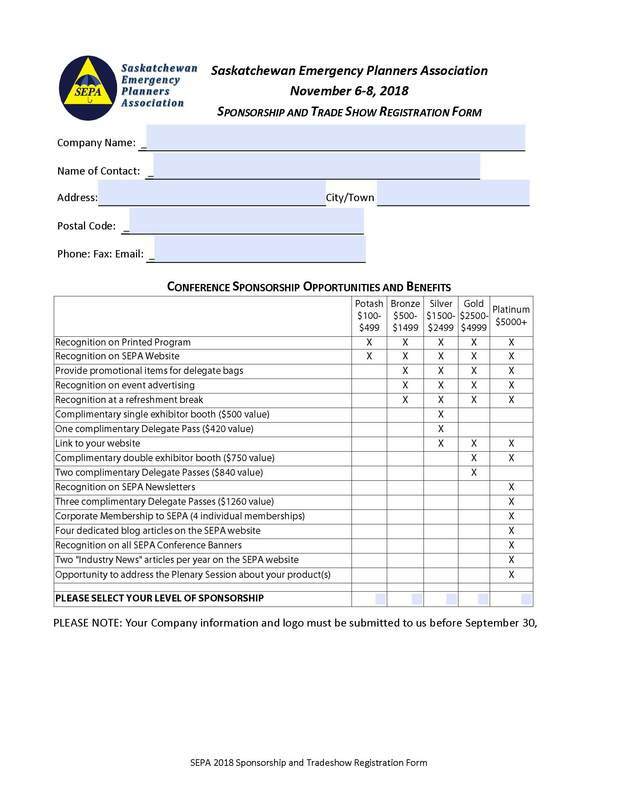 Please ensure that you clearly indicate that your pre-paid shipment is for the SEPA Conference.